Pan chose to retain the spiky-toothed teddy bear when they introduced the new logo in 1967. You will not be surprised to learn he/she/it fails to make an appearance in any of the stories in Pan3. Booo! Private Secretary Jim Shorthouse is called in to meet with his employer, businessman Jonas Sidebotham and tasked with the simple-sounding job of taking a clutch of documents to his (Sidebotham’s) former business partner (Garvey), who wishes (for reasons not totally made clear) to cut his signature from the documents. Whilst, at 34 pages, “Adventures” represents perhaps a rather lengthy opening to Pan3, the narrative never flags. Although the journey is a touch disorientating at times, as I feel Blackwood could not quite make up his mind exactly what sort of story he wanted to write. Beginning as a sort of Chandler/Spillane-esque thriller with mutterings of blackmail and the rattle of financial skeletons in closets, the tale enjoys a brief flirtation with lycanthropy before settling down into a run of the mill guest-staying-overnight-in-possibly-haunted bedroom scenario. And although Shorthouse is beset by all manner of annoying visitations - at his bedroom door, his window and from behind portraits - he cuts such an accomplished figure he never seems in any real danger, literally running rings around his hapless adversaries. The blatant anti-semitism throughout the tale (Garvey’s butler is referred to as “The Jew” throughout), jars somewhat I have to say, although the surreal conversation Shorthouse endures with his host re the butler “always tumbling into vacuums” is a delight. After spending the previous three years in a “private home”, young Nora is finally going home tomorrow. Unfortunately one of the establishment’s clinicians has some mind-over-matter theories regarding pain control he wishes to investigate. 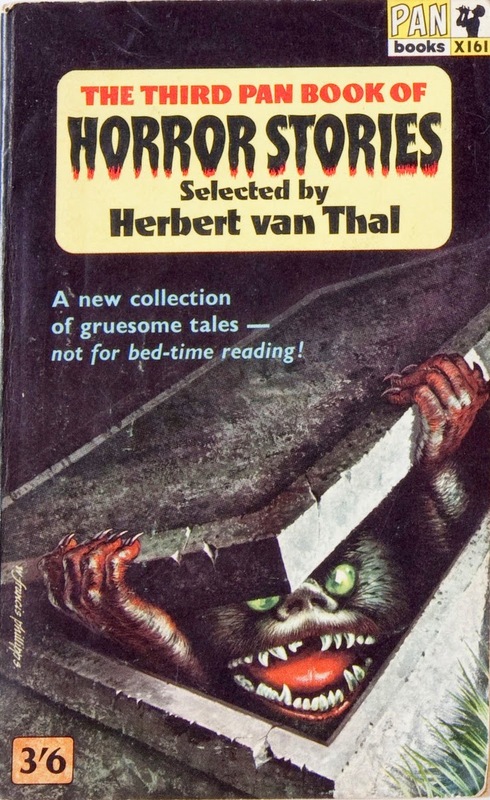 I really, really did not like this one when I first read it back in the early seventies. I found it both disturbing and disquieting, which I suppose, one could argue, is exactly the result any horror story writer wishes to achieve. Rereading the thing recently I found it’s ability to unsettle had not diminished with time. Part of the reason I think is the age of the victim (although never made clear, she is repeatedly referred to as a child), and also the almost tangible sense of helplessness she endures. But the prime reason for my dislike was the fact the whole business just seemed so………well, darned unfair. Nora was, after all, entitled to her freedom. She had earned it. Her nemesis, the creepy Dr Morris really is a nasty piece of work, and clearly off his head – although his silly error which leads to his capture does stretch credulity a touch. But Birkin’s lines describing how Morris’s experiment goes fatally awry still pack a wallop. Jacob Trezbond has had a good day. For not only has just strangled his tedious high-maintenance wife but, perhaps more importantly, has recently acquired a rare creeper-plant seed he has coveted for some time. However, when he chooses to plant the seed where he buried his late wife’s body, the resultant plant turns out to be far more troublesome than his former spouse ever was. Meshes of Doom takes the form of a found diary/journal – a device used in a number of Pan stories to varying degrees of effectiveness. The problem with all such devices is always how to deal with the final entry. Proceedings either dribble to a close with the final dénouement taking place off-stage, as it were, or we have the diarist doggedly writing until the bitter end. Kilvington decides on the latter approach here and has Trezbond, somewhat preposterously, frantically scribbling even as the titular meshes are closing about him. This flaw notwithstanding, “Meshes” is an entertaining if rather unsubtle piece of hokum, as we follow Trezbond’s jottings as he disintegrates from cold-blooded killer to full-blown basket case in a matter of weeks. I am in two minds whether the coda (written by a colleague of Trezbond’s) adds or detracts from the story. For whilst it certainly clears up a few loose ends, it does detract more than a touch from the fun of any subsequent re-readings. Inveterate gambler Grey is enduring a “depressing run of luck”, when he brings home a stray yellow cat he encounters on the way home from his latest evening of financial imprudence. Overnight his fortunes at the card tables and roulette wheels take a turn for the better. Even dead former acquaintances turn up to repay non-existent loans. But one evening Grey does the cat a great injustice, and pays the price. Although there are fundamental differences between the two stories, I cannot help but feel The Yellow Cat owes more than a little to Edgar Allan Poe’s The Black Cat. In both yarns a vice-ridden individual (in Poe’s tale alcoholism is the curse) adopts (or is adopted by) a stray cat, and in both when the protagonists do nasty things to their respective moggies, they set themselves along a path to ruin. Where the two stories significantly differ is that Poe’s tale is set in the rational world, whilst there is a rather intrusive supernatural element to Joseph’s. Grey’s dead friend pops briefly into the tale early on, for no other real reason than to show the reader that the yellow cat can do some weird stuff. And the manner of Grey’s final demise is so at odds with the rest of the story, it almost makes one think the author had run out of ideas. An interesting rather than essential entry to the collection. Mrs Willoughby’s mum is a bit dotty, and getting worse. In an attempt to continue caring for her at home, she employs a couple of nurses and has the doctor prescribe a low protein diet. However, the old biddy soon finds herself craving meat. This is a not dissimilar tale to The Last Night, earlier in this volume. In both a child is slaughtered by a mad person in a locked room. (In case you hadn’t guessed, the two authors Charles Lloyd and Charles Birkin were one and the same individual). Quite why this one failed to disturb me to quite the same extent as The Last Night, I am unsure. I think it was partly because the victim in this tale is such a two-dimensional character that I failed totally to empathise with her. Additionally, the end game was clearly telegraphed from halfway through. When someone is discovered beheading mice to drink their blood in order to “get her strength back”, one can be sure things are not going to end well for one of the other characters. Playwright Oliver Windthrop is struggling with writer’s block, so decides to rent a tumbledown moorland cottage to help provide the atmosphere to allow him to pen his next success. Whilst Oliver loves the place, his wife Frances is less enamoured. She can just about cope with the hideous old woman who owns the cottage. But that old skull lurking on the window ledge is another matter. Pan3 was the first collection I bought and I can recall being more than a little disappointed by the first few stories I randomly chose from the collection. But Unburied Bane was the business. I am not ashamed to say it scared me witless upon first reading, and remains a tale which has stood up to repeated visiting over the years. Much of its effectiveness is down to Dennett’s characterisation of Frances Windthrop. I found I empathised totally with the character, and genuinely cared about her fate. Dennett also created a wonderfully claustrophobic atmosphere, enhanced by having almost all the action taking place within or around the isolated cottage. The tale is not perfect and there are a number of plot holes. Why didn’t Frances investigate further when no-one in the nearby village seemed to have heard of Ann Skegg? Would Frances really have chosen to stay in the house when her husband nipped off to London? But of course both these decisions progress the narrative. Some of Dennett’s autumnal descriptive prose is quite really rather beautiful, but the tale becomes progressively darker as winter sets in, the tension gradually mounting to the (perhaps, slightly confusing) climax. (Where did the bat come from?). For all that, Unburied Bane is an at times exhilaratingly scary ride, and undoubtedly the strongest entry in Pan3. The narrator (we never learn his name) answers a call from an old friend to operate on his fiancée, who is suffering from a bowel tumour – a tumour with tendency to wander. This is that rarest of beasts: a tale with two authors. Although with such a short (four pages) tale, I cannot really imagine Messrs Jepson and Gawsworth settling down to compose the thing together. Rather, I wonder if Gawsworth completed some already commenced manuscript after the other’s death. Gawsworth was only 26 when Jepson died in 1938 at the age of 75, although the two were friends. Whatever its gestation, “Growth” is a fast-paced anecdote which zips along at a fair old lick, towards its deliciously gross conclusion. Gross but silly, for (and I don’t want to give too much away here), we all know the gut is an anaerobic (i.e. oxygen free) environment. But it is only when one gives the tale a bit more thought that the Yuk factor cranks up a few more notches. For the “growth” could only have entered the delectable Ms. Bard by one of two routes. And given it was discovered south of the acid-rich stomach, one can only surmise the visitor entered by, shall we say, a more fundamental route. Gross and double gross! There’s been a murder. At least the police suspect so, but without a body they cannot pull their suspect in for questioning nor, it appears, even enter to search the cottage where they believe the crime may have occurred. Enter the odd couple of relish salesman Smithers and Oxford graduate toff-on-a-gap-year Linley, who solve the mystery over supper. We are into Holmes and Watson territory here, with chess-obsessed intellectual Linley taking the former role, and the self-proclaimed “small man” Smithers performing the Watson bit as narrator. But the character of Smithers with all his obsequious Uriah Heep-isms, is far more irritating than the bumbling but likeable Watson ever contrived to be. Although I did smile at his faux-pas “You don’t have to quote the whole of The Inferno to show that you’ve read Milton”. I feel “Relish” has the feel of a tale written backwards; Dunsany having come up with the dénouement first before building a contrived and overly complex back story to support it. For this contrivance really is a house of cards built upon sand, stretching credulity more than a little. Particularly the scene where Smithers is permitted by the local bobby to poke around the crime scene. The reclusive Miss Emily Grierson has been a fixture in the Mississippi town of Jefferson for as long as anyone could remember. So when she finally keels over at the ripe old age of seventy-four, the townspeople can barely contain their curiosity to finally view the inside of the old lady’s house. As one might expect of such a literary heavyweight as William Faulkner – both a Nobel and a Pulitzer Prize winner – there is a whole lot more going on in “Rose” than a tale of a loopy old fruit-bat. Even upon my own first reading as a callow youth, I could see Emily’s decline was an allegory in some way for the loss of the old Southern way of life. Dust is never far away whenever Emily is mentioned in the text. No doubt there are many other layers of subtlety hidden away by the redoubtable Mr Faulkner, but even when read as just a common-or-garden horror story, “Rose” works remarkably well, with the really repulsive stuff occurring off-page as it were. As an aside, when I first heard the Helen Reddy song Delta Dawn, the lyrics of which also reference a rose, I was put in mind of this story. And wondered if songwriter Larry Collins had been a fan. Sally Russell has, for reasons she cannot herself quite fathom, chosen to accept an invitation to visit the widow of her recently deceased lover. Margaret de Civennes resides in an isolated chateau near the French/Spanish border, with just her almost equally ancient housekeeper for company. Oh, there is also the old woman’s hulking half-witted son, Pierre. Things do appear to be going along unexpectedly well between guest and hostess, until Sally makes a chance remark concerning a poem Andre had once sent her. The two mysteries of this tale, neither of which are truly resolved, concern the motivations of the two protagonists. Sally asks herself in the opening line “Why did I come?”, and although she makes some vague reference to cultural differences between Spanish and English women we, at the end, are no clearer to understanding why she made the frankly baffling decision she did. The other conundrum is whether Margaret always had it in her mind to do in the hapless Sally, or whether she only chose to do so once it was revealed that her husband had sent Sally the very same poem he had used to woo Margaret decades before. Although, one would have thought this further breach of trust would have simply raised Margaret’s ire against her philandering hubby. Perhaps there was a bit of punishment by proxy going on. What is true is that the tale certainly takes a darker turn after Sally’s remark about the poem, and her revealing to Margaret that she has told no-one of her whereabouts pretty much seals her fate. Lloyd’s vicious climax to the story presciently predates the almost casually brutal violence which would become the staple of later PBoHS collections, and it came (to me anyway) as a bit of a shock to learn that this story dated back to 1933. When a friend announces his engagement to a girl whose “mother was an Englishwoman”, Brinken offers only his guarded congratulations. To help explain his reticence, Brinken first gives a deadlier-than-the-male nature lesson, before going on to relate an account of a liaison he had as a teenager with one Lady Cynthia Bingham. The affair taking place under both the roof, and the seemingly blind eye of her husband Sir Oliver. But Sir Oliver had a nasty shock in store for his young guest. On first reading I was left with the impression that the whole back story to “Damiens” was a mere vehicle to facilitate the frame-tale of the execution account. Which is pretty gory, even by Pan standards – a true story, one Robert Damiens, after being found guilty of attempting to murder a French monarch, was publicly hung, drawn and quartered in 1757. But subsequent reading suggests there is clearly some deeper stuff going on. And the real horror is Brinken’s realisation that Lady Bingham, this fairy-tale creature of his dreams, was not only present at the execution, but can only get turned on by re-reading an explicit eye-witness account. At least that is my interpretation. Happy to hear anyone else’s. Compelled to seek haven in a lagoon, the captain and crew of a sailing ship find themselves repeatedly under attack by a large squid-like creature. After killing two members of the crew, the creature next comes a-knocking at the captain’s door. “Leech” has the feel to it of an incident taken from some Jules Verne type nautical epic, rather than being a standalone short story. As, without any preamble, the story opens with a crew member hammering upon the captain’s cabin door, and we are pitched headlong into the action. The suggestion that the episode may form, or perhaps was intended to form, part of a greater whole is reinforced by the presence of a number of intriguing little back-stories, hinted at without ever being even partially explained. We learn the ship has just survived some ordeal or other, leaving her with “tattered sails”, whilst the captain acknowledges he hasn’t “much authority here”. But no details are forthcoming upon either issue. There is an almost dreamlike aspect to the descriptions of the creature’s risings, reflecting the hypnotic effect it appears to exert over those who encounter it. But perhaps also suggesting the whole business is merely a bad dream the skipper is having. For the crisis to only be drawn to his attention once the leech had already visited the ship seven times, does appear rather unlikely. And witness the captain's reaction to his capture by, and subsequent rescue from, the leech’s tentacles. “I didn’t really suffer….I enjoyed it”, he stated later, before admitting to expressing pity for the creature as it was torched; being burned, I might add, in order to save his life. But dream sequence or no, “Leech” is an enjoyable piece of pulp which I feel works well on more than one level. The sixteen year old daughter of eminent physician Dr Peters has been found murdered on Wimbledon common. The prime suspect, the family chauffeur, is unlikely to be charged, as there is insufficient evidence to place him in the vicinity at the time of the crime. However, when just such evidence subsequently finds its way to Dr Peters, he decides to administer justice in his own inimitable manner. 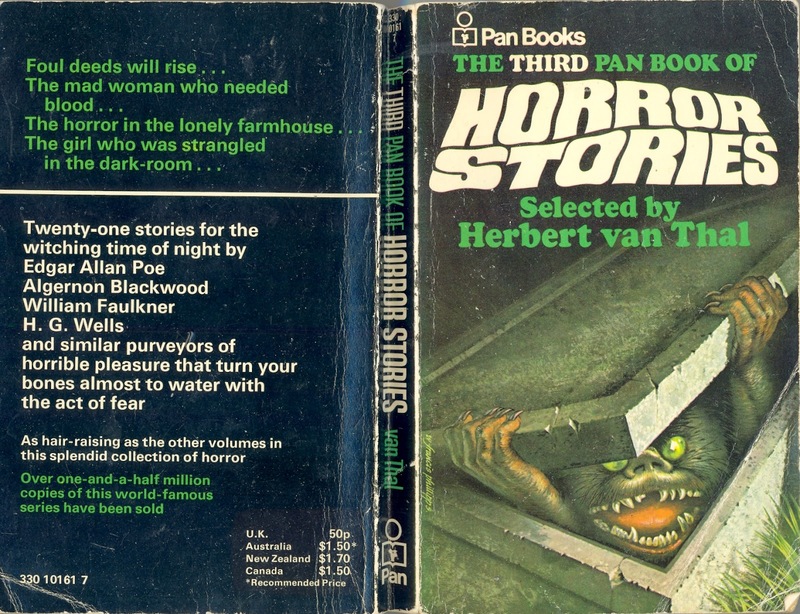 The PBoHS collections abound with revenge stories – there are four in Pan3 alone, of which this is undoubtedly the weakest. The problem is the confused timeline of the narrative. On the evening of the murder Yarrow (the chauffeur), whilst making his escape encounters Nelly, an ex-girlfriend. Nelly is hit by a car immediately afterwards, and awakes two days later in hospital. One week further on, she sees Yarrow’s face in the newspaper, by which time the chauffeur has apparently already been tried and acquitted. Even allowing for (or attempting to) the fact the story timeline may be non-linear; the wheels of justice do appear to have turned unfeasibly swiftly. Equally anachronistically, we earlier learn Dr Peters has “done such wonders with the thyroid experiments”, so have to assume his speciality is endocrinology. Yet he happily rolls up his sleeves later in the tale to indulge in a little home-surgery on the hapless Yarrow. I do appreciate that horror stories in general require, shall we say, higher than usual levels belief suspension on the part of the reader, but reading “Eye” I found to be a particularly frustrating experience, due to its colander-like plot line. Renowned “ghost-finder” Thomas Carnacki is invited to Ireland to investigate odd goings-on at Iastrea Castle, where a persistent whistling noise has been traced to one of rooms. Mischievous locals are the likeliest suspects, but the redoubtable investigator unearths a rather more unearthly truth. Carnacki, who appears to be a cross between Hercule Poirot and Abraham van Helsing, is a recurring character in a number of Hodgson’s short stories. In each the writer has his hero relate his investigations into some seemingly supernatural occurrence to a group of friends after the event. One twist of brilliance the author brought to the stories was to have some of the mysteries having paranormal elements, with others being resolved within the material world, as it were. Thus one never knows, when reading any Carnacki mystery, if the natural or the supernatural is going to be unearthed. Carnacki’s dialogue in “Room” is littered with references to previous cases (Grey Dog, Silent Garden, Grunting Man etc), perhaps to impress upon the reader how adept he is at solving such conundrums. The ghost-finder also spouts copious amounts of gobbledegook concerning beings such as "The Aeiirii" and "The Saiitii", and also the “Unknown last line of the Saaamaaa Ritual” (Hodgson just loved a vowel, apparently), without really expounding upon any to a satisfactory degree. That being said, “Room” was one of the two stories in Pan3 - the other being Unburied Bane - which genuinely scared me upon first reading, forty or so years ago. Hodgson’s description of Carnacki’s lone investigation of the chamber, and his subsequent up-the-ladder discovery had me riveted. Although the deux ex machina which pitches up to save the day really is rather too convenient, and not a little anti-climactic. I really was wondering how Carnacki was going to extricate himself from the pickle he had got himself into. But a fine entry to the collection for all that. Just one plot hole I should like explained though: how come what caused the whistling failed to disturb Carnacki’s “little colourless wafers”? Harry Peters has made a really rather remarkable discovery. For hidden away within the library where he works, he has unearthed an old tome detailing how to create a poison “impervious to Heat, Ray of Sun, Ravage of Life or Time”. With this he plans to rid himself of his boorish wife, but only after setting a few false trails for the police. There is not really much to say about this one. With tongue firmly in cheek, Carroll’s tale is penned with such a light touch, we almost forget the fact Peters is a cold-blooded, indiscriminate serial-killer, and (dare I suggest it), perhaps even begin to warm to him. It is clear Carroll had great fun writing the yarn, and when Peters reveals a couple of the other formulae in the old book, one cannot help but feel there is a touch of wistful wishful thinking going on inside the author’s head. In the interests of science, the terminally ill M. Ernest Valdemar has agreed to be mesmerised (hypnotised) at the moment of death. Afterwards, although to all intents and purposes deceased, Valdemar remains able to communicate, even informing those conducting the experiment “I am dead”. He is maintained in his mesmerised state for almost seven months, before an attempt to wake the patient results in a decidedly messy and unexpected conclusion. Poe loved a hoax – perhaps his most celebrated example was his epic adventure yarn The Unparalleled Adventure of one Hans Pfall. “Valdemar”, with its use of the word facts in the title and the authoritative tone to the opening paragraph, almost purports to be an actual scientific report. Indeed Poe published the tale in The American Review - a periodical covering “Politics, Literature, Art and Science” giving no indication that it was a work of fiction. An early example of the body-horror genre and, whilst the science may not stand up in these more sophisticated times, the final line still packs a punch. Young Amelia Jenkins is employed in the service of old Mrs Bishop. She does not care for her job much, and likes her employer even less. But she is rather intrigued as to what the old woman keeps behind the locked door on the first floor. When a dream!! shows Amelia a way to access the room, she learns Mrs Bishop’s shocking secret and pays the price. The author Elliot O’Donnell can certainly be said to be a chap who enjoyed a full and fulfilling life. Born in Ireland in 1872, he spent time as a cowboy, then as a police officer in the US, before moving to England where he held down jobs as a teacher, actor and soldier, prior to settling down to earn his daily crust as a professional ghost-hunter. He wrote prolifically on this latter subject, both fiction and (purportedly) factual accounts. Given this colourful background, it is all the more puzzling that O’Donnell should be responsible for penning such a dud as “Mystery”. Even allowing for the fact the yarn covers no more than six pages, nothing much happens; a rather too nosy girl goes poking around where she shouldn’t and gets throttled for her troubles. The only point(s) of interest are the two supernatural events which occur: Jenkins’ dream where she is shown where the key to the locked room is hidden, and her encounter with the spirit of her employer’s murdered late husband. Neither really makes any sense, unless one believes the dream to have been somehow instigated by the ghost, in an attempt to show the girl he had been murdered. Perhaps in an attempt to somehow bring his murderous spouse to justice? If so, he failed miserably. Although, if I am honest, I think perhaps I am applying a layer of subtlety to this dull tale which does not really exist. Dr Nicholas Fawcett has been dabbling in things he really should not be dabbling in. Attempting to create “life from dead animal matter”, he appears to have fashioned some pulsing egg/fungus hybrid. But what will hatch from it? With a lone, unhinged scientist playing at God, we are clearly in Frankenstein-ville here. But whereas Victor unintentionally ended up using brain tissue from a criminal (in the film, I mean), here Fawcett’s experiment will apparently only succeed if the material used comes from an insane individual. Quite why this should be the case is never made clear, indeed all of the actual science is disposed of by the simple expedient of the author having Fawcett delete all references to his methods from the journal which forms the bulk of this run-of-the-mill tale. The individual relating these events owns a small cottage on an isolated stretch of the Hampshire coast and, as he tends not to spend any time there over the winter, takes on retired sailor Horter as a caretaker. All appears to be going well, until Horter’s letters cease, and a consequent visit by the owner reveals all is rather far from well. It is pretty much impossible to talk much about this one without detailing the plot, so I make no apologies for doing so. The cottage owner initially had serious reservations about the lugubrious Horter living alone in the isolated spot, describing his demeanour as that of a “gloomy old bird” and “like a sorrowful and haunted seagull”, so is naturally anxious when what had been regular written communications cease. The owner upon reaching his property, finds it locked up and seemingly deserted, but after breaking-in discovers a number of dead seagulls piled atop the skeletonised remains of his caretaker. Horter’s journal, found nearby, reveals he had believed himself some years earlier to have inadvertently eaten the soul of drowned shipmate, by devouring a seagull into which the soul had found its way. According to the diary Horter was convinced the gulls wished revenge, and he had initially attempted to placate them by feeding them strips cut from his own flesh. But eventually the birds had seemingly decided to help themselves. As with all found journal stories, we have to be wary of the unreliable narrator. My own interpretation of events is that Horter, racked by guilt and in a desire to fulfill some death-wish had lured ten or so gulls into his cottage. Locking the windows and doors he had then commenced to hack into his own leg to feed them, swiftly bleeding to death, leaving the gulls to die from dehydration. Quite how Horter’s body was skeletonised so quickly is a bit more of a conundrum – perhaps other gulls did the picking, after finding their way in and out of the cottage via the chimney? The incident where a gull attacked the cottage owner upon his arrival could either be a consequence of this one having developed a taste for human flesh over the previous few weeks, or was possibly even Horton reincarnated? There are lots of tasty loose ends to chew over with this tale. Leo is a scientist who generally spends his evenings beavering away in his home laboratory attempting “to find a cure for the one incurable disease”. But he accepts with good grace the news his wife Greta has invited Franz, one of her oldest friends to dinner at short notice. Leo can just about put up with their guest’s drinking and risqué jokes, but when he misinterprets Leo’s clumsy attempt to kiss Greta as a lovers’ meting, he decides redress is required. Bertie closes his Pan3 collection with a brace of revenge stories, although Lovers' Meeting is rather different from most of the type, in the fact that the unfortunate recipient of the retribution has really done nothing to merit it. Although, given the tale is set in frightfully proper Austrian society where servants have to be informed when guests are expected and women change for dinner, perhaps Franz had crossed a line. More likely he was just unfortunate in encountering a husband who not only had a screw loose, but had also access to a collection of nasty disease serums. As with many of the shorter Pan entries, the whole narrative is mere prelude to the sting in the tail. But this one is just weak filler, in my opinion. Raut is planning to elope with the wife of his best friend Horrocks, but the lovers have not been discreet enough in their scheming. To hopefully allay suspicions, Raut is compelled to accept an invitation by Horrocks to visit the iron foundry managed by the latter. Bertie closes out Pan3 with another adulterer getting his comeuppance, this one in a particularly pitiless fashion. With Wells’ description of Raut’s tour around the foundry to the cone of the title, clearly resonant of some sort of Dante-esque journey to his own personal hell. The tale is well-written and builds the tension to its cruel climax quite beautifully. My only gripe is that I found the description of the actual cone device quite ambiguous, so could not really visualise exactly what was going on. Is the titular cone pointy-bit up or down? I have no idea.